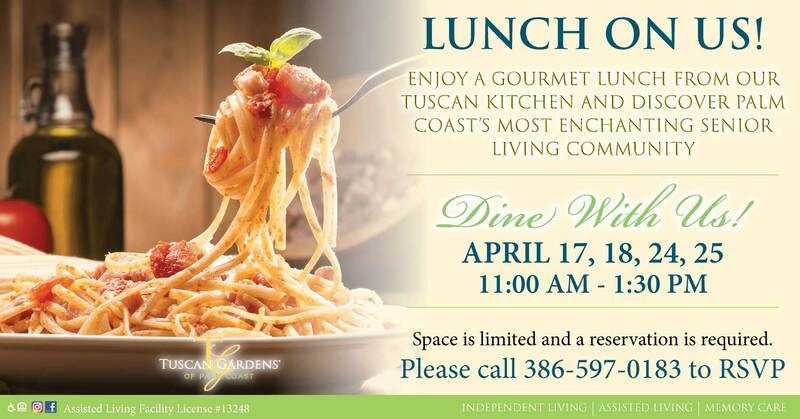 Feed your curiosity with an exclusive look at our innovative independent living, assisted living and memory care community — plus, enjoy a taste of senior living at its finest with a gourmet lunch from our signature Tuscan Kitchen. We’ll showcase our dedication to elegant hospitality, five-star amenities and vibrant lifestyle offered at Tuscan Gardens® of Palm Coast. Don’t miss your chance to dine with us and discover a future full of beauty, grace and possibility.